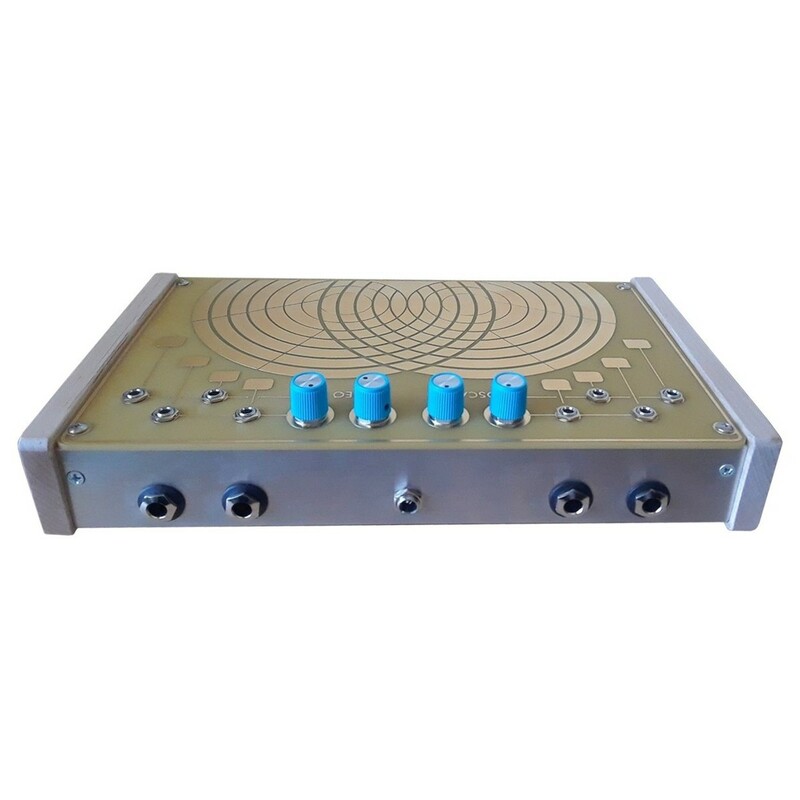 A ground-breaking multi-purpose atonal synthesizer. 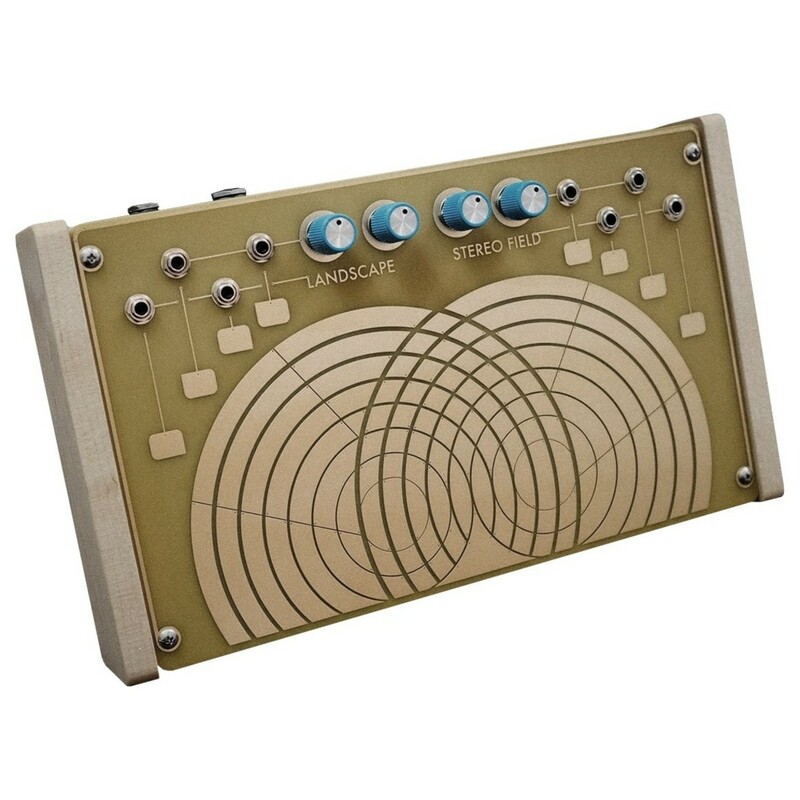 The LANDSCAPE Stereo Field is a trilogy of instruments rolled in to one. It combines a stereo/quad modular touch plate feedback atonal synthesizer, stereo/quad audio processor and a pressure-sensitive CV controller. The Stereo Field features a unique touch-plate that allows you to interact with sounds in ways never seen before. New sounds and tones will be triggered by creating new 'circuits' with your fingers. Touching the synth with multiple fingers will trigger atonal analog feedback for interesting results. The instrument boasts a wide range of controls and parameters including waveforms, filtering, feedback, formant and FM. 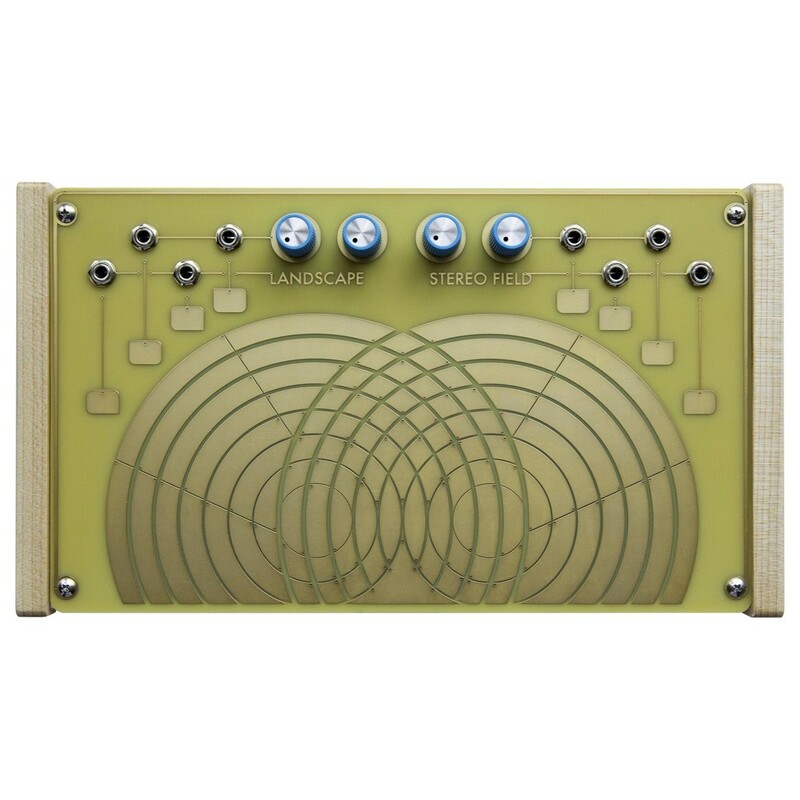 The Stereo Field Atonal Synthesizer is a multi-purpose synth instrument. It combines the functionality of a stereo/quad modular source, stereo/quad audio processor and a pressure sensitive CV controller. Each of the three modes can be used independently so you can you use it for various sound design and processing applications. The unique design allows you to interact with your sound in ways never seen before. The semi-circular metal touchplate utilises skin conductivity to create new current paths. The touch of your finger completes the two analog stereo preamps circuits allows you to create new circuits at the touch of a finger. Using multiple fingers to touch the plate triggers atonal analog feedback. This is draw from one of the two mirrored circuits. The ensuing feedback is chaotic and unpredictable, sometimes passing the limits of human hearing. It can range downward to the point it results in ultra-slow clicks of a saw waveform. With its versatile manipulation options, the Landscape Stereo Field is ideal for sound design. Inputted sound sources can be redirected to any area of the circuits. The experimental synth can process and generate everything from waveforms to effects including feedback, wave folding, feedback and even the generation of FM sounds. 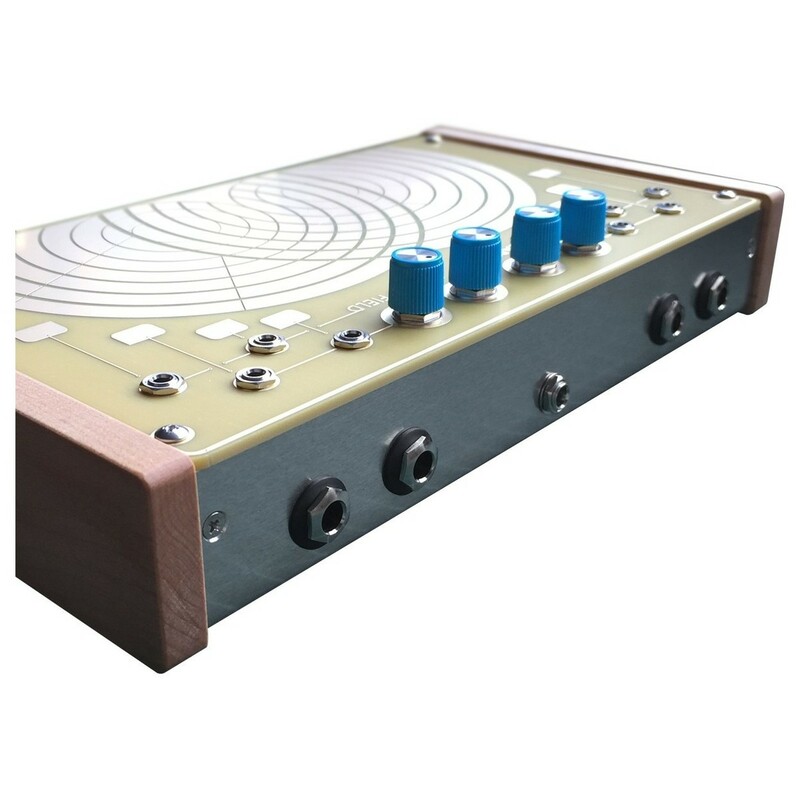 The four blue knobs are accompanied by eight patch points which can be used to control parameters and effects. The CV connectivity allows you to incorporate external audio sources such as outboard modules, instruments and synths. You can even patch the connections back into the Stereo Field to create self-generated tones and effects. Not only is the Stereo Field perfect for mangling and manipulating sounds, it can generate a wide variety of effects. From brash and in-your-face distortion to subtle sweeping filters, you can add texture to a wide variety of tones. The 4 inputs and 4 outputs include smaller touch plates for controlling the sound. Running multiple audio signals into the Stereo field makes them entwine and modulate one another. The synth can achieve a wide range of sounds and effects including distortion filtering, high/low-pass, feedback, square and sine waves, pulse width modulation, white noise, pink noise and more. The touchplates allow you to control multiple effects via shifting, feeding back or pulsing in sync with incoming audio. The stereo and quad imaging of the Stereo Field uses the feedback and modulations to deliver complex results. Dimensions: 10" x 5.75" x 1.5"